I was trying to modify an electronic thermostat and found a 5 band resistor with Brown-Yellow-Black-White-Brown. I never seen such a resistor and a website calculator show that it is 10G Ohm 1%!! I attach the photo of the board (look for R12, R16) and diagram I made. This is for info only. You are adding to an old post and reading the colours the wrong way round. Topic split. I have to applaud the OP for finding that old thread.....good effort searching. 1M9 seems an unusual value. Especially with 1% tolerance. Hey-ho, you should be able to measure it with a DMM. Since your pcb looks like a SRBP material, it does not have very good physical or electrical properties. 140G would be pointless value but the manufacturer would deserve a medal for 1% tolerance !!! It looks like a case of ambiguity. Just like the American Date system. Does 12-01-2019 mean 12 January or 1 December ? Sometimes it helps to swap your DMM probes or use another DMM with lower measurement voltage. Lifting one leg is more reliable. Does 12-01-2019 mean 12 January or 1 December ? If you lived here you would know, correct? The European date format for January and December could also have the same issue. Nowadays, PC software tends to adjust to the locale. In the old days you had to do a lot of guesswork. Much software originated in the U.S. and Europeans had to do some detective work. You would have had the same problems with early European software. Fortunately important paper forms prompt you for DD-MM-YYYY or whatever. But I still have to make mental adjustments for human speech and hand written dates. U.S. citizens have to do exactly the same when they encounter the civilised world. As told me way back in the early days.....When in Doubt, remove it form the circuit and measure it properly. Which others here have mentioned. I would be hesitant to believe a thermostat would use a 10G resistor to begin with. Or any consumer item for the most part. 1M9 seems an unusual value. Very unusual. So unusual in fact that I'm struggling to find one. It is the sort of value you'd expect in that location in the circuit though, it adds some hysteresis to the comparator. I'd expect something between 1M and 10M. The schematic isn't quite right though; there is a missing pull-up on the output of the comparator. They are open-collector so at the moment there is no way to source any current. And it's not 140G as that wouldn't work in the circuit. Much of that circuit is build with gold banded tolerance parts! And its a thermostat, so having some parts with specific thermal temp coefficients isn't too surprising, either. As it appears that a fair amount of care when into the original design, how were intending to improve upon it? As a single sided PCB it should be relatively easy to draw a schematic for it, as it appears you don't have one. 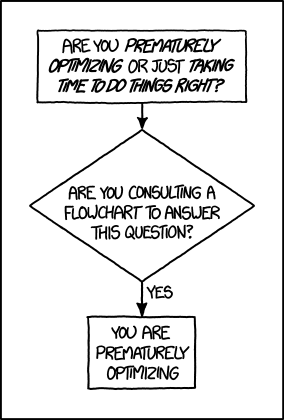 The "diagram.jpg" looks remarkably like an already reverse engineered schematic. Is the offending resistor is the one marked with " 140G! " ? 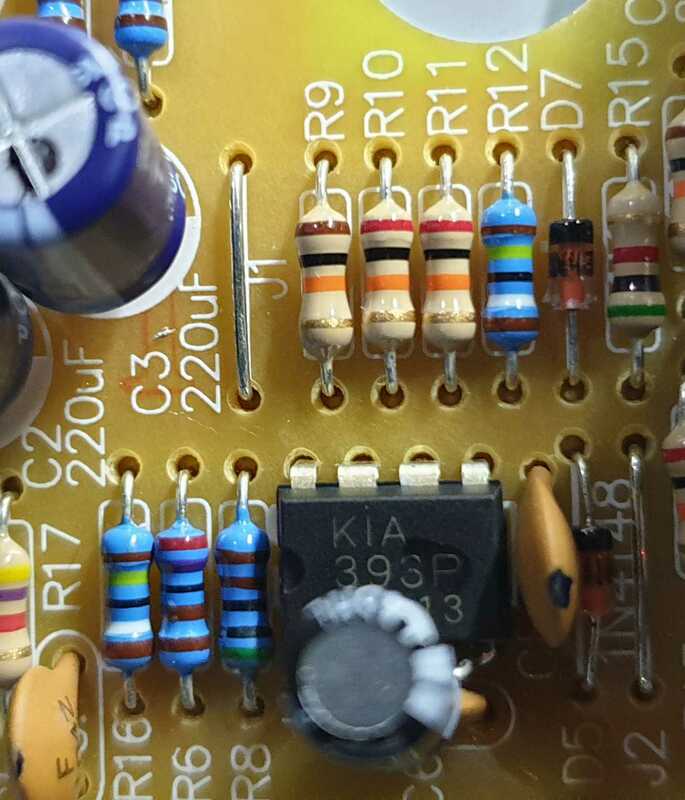 This resistor generates positive feedback to the comparator. This is usually done do define a nice switching moment without having the output switch multiple times by for example small differences caused by noise. This also has a name. 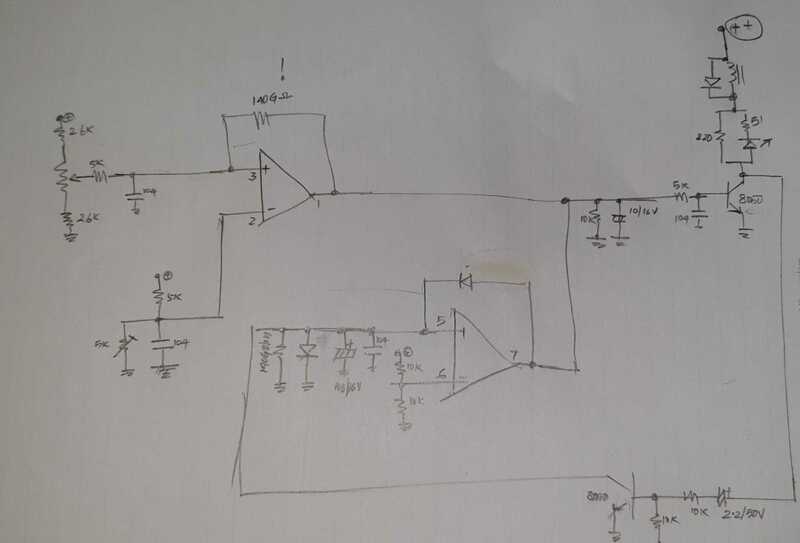 It's called "Schmitt trigger"
There seems to be something missing from your schematic though. The LM393 has an open emitter output and can only pull the output to GND and relies on external circuitry to pull the output high, but I do not see that on your schematic. The resistors in question have 5 bands. Only 6 band resistors have a "temperature coefficient" colour band. Apologies to Jim. I was only trying to point out that different conventions can cause confusion. And it works both ways. Yes, of course the U.S. is the most powerful country in the world. It can choose to use whatever units it likes. The world is much bigger than one country. Both in population and GDP. This is an international forum. USD are understood by everyone in the world whatever your local currency. And there are 2 of those weird resistors in the pic. And the floating gates of flash memories and eeproms? They must discharge at a rate of 1V/decade or so. I don't know how much charge they hold, so I can't calculate their leakage resistance. Must be ridiculously high. And the floating gates of flash memories and eeproms? 14. Long term drift is logarithmic in nature and diminishes over time. Drift after the first 1000 hours is approximately 10ppm.